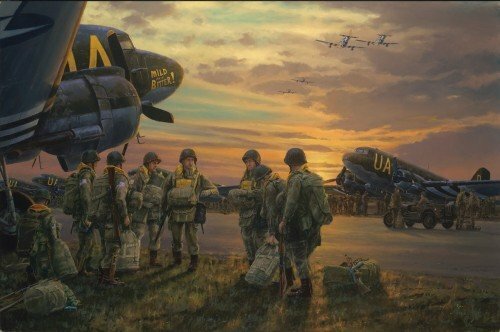 On the evening of 5 June 1944, at a dozen airfields across southern England, more than 13,000 American paratroopers prepared themselves for a mission that would change the course of history. The next morning these brave young men found themselves at the forefront of the bitter fighting to secure the right flank of the Normandy beach-head. The odds against them were huge and, if they failed, the American amphibious landings on Utah and Omaha beaches would face disaster – the destiny of the US First Army rested squarely on the shoulders of the 82nd and 101st Airborne Divisions. Anthony Saunders brings to life the tense few hours before departure in his dramatic new painting. As daylight fades, men from the 505th Parachute Infantry Regiment, 82nd Airborne Division, prepare to board the C-47's of the 43rd Troop Carrying Squadron that will take them to Normandy. Serving as Radio Operator on the C-47 "Placid Lassie" he dropped paratroopers from the 101st Airborne Division in the early hours of D-Day. Jumping on D-Day into Ste-Mere-Eglise (the third of his four combat jumps) he successfully captured the bridge over the Merderet River just outside the town.